Over drinks with colleagues the other evening the topic of blogs came up. While we all admitted to reading blogs on a regular basis, I was the only one amongst us who blogs (or even has a website). My colleagues doubted the value of a blog. Consequently, I found myself justifying to them the time and effort I invest in writing a blog, labor that seems to be uncompensated and, given the current systems of rewards in the U.S. academy, uncompensateable. My justifications included the platitudinous “outreach” and inchoate ideas about engaging in public debates. I tried to convince them why I blog. They tried to understand why I would blog. In the end, I suspect we are no closer. Becky points out that most academics don’t blog for public outreach. In contrast to much of the rhetoric around blogging, most blogs they analyzed were written for other academics, not an interested public (read the whole article, which brings up some interesting points, especially about blogs and regulating what academics can say in public). Their work analyzed the content of blogs. I wondered: How would academics who blog describe their motivations, their intended audiences, and the benefits (if any) they receive from blogging. Initially, I retweeted Becky’s tweet, asking #whyblog? 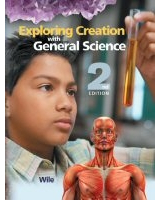 If not for outreach, I wondered, then #whyblog? But then I thought, why not put together a small survey and collect some information to extend Thomson and Mewburn’s initial conclusions. So that’s what I did. While I try to understand academic broadly, more of a scholar, I remain interested in why people with some academic affiliation blog. I realize that some academics contribute to more than one blog and that their goals likely change with each place. If you are such an academic, please complete the survey for each blog. Finally, I am not an expert in designing and conducting surveys. If you are and would like to work together to do a better job at it, please contact me. I will post the results when I have gathered enough to make them meaningful. Thanks for taking the time. Please send your academic blogging friends this way. Dr. David L. Katz has no patience for “New-Age nutrition” and its apparent assault on the calorie. See, for example, last October’s The Race to Redefine Calories: Iconoclasts, Start Your Engines! and his more recent Newtonian Nutrition. Unfortunately, while taking people to task for getting the science and facts wrong, Katz gets a rather basic fact wrong, a fact that stands at the center of both his posts. Katz and his fellow scientists should expend as much energy confirming facts and evidence outside their fields of expertise as they expend policing the facts and evidence within their domains of expertise (or they could consult with experts in those fields or stop thinking their scientific expertise gave them license to speak about any topic). The evidence that the quantity of calories counts, along with the quality, is incontrovertible-beginning with the laws of thermodynamics first established by Sir Isaac Newton. There is a fixed relationship between matter and energy, bound by the laws of physics. Biological variation is important, but physics is the bedrock on which other sciences, including biology, must stand. The Huffington Post added this nice image of Newton to its version of Katz’s post. Newton’s First Law of Thermodynamics asserts, essentially, that energy can neither be created nor destroyed in any closed system—it has to go from somewhere, to somewhere else. Energy and matter can be interconverted—as is the case when the energy represented by calories is converted to the smaller (glycogen) or the larger (fat) of the body’s energy reserve depots. In other words, according to the “laws of thermodynamics first established by Sir Isaac Newton,” or more precisely, “Newton’s First Law of Thermodynamics,” unused calories become mass. Okay, except Isaac Newton had nothing to do with the laws of thermodynamics. Newton died in 1727. The laws of thermodynamics were worked out over a century later, in the mid-19th century. Katz’s argument contains a serious factual error. The race to redefine the calorie has a vociferous group of iconoclasts revving their engines. If you are genuinely convinced that any of these characters is smarter than Sir Isaac Newton, and/or has probed to levels of understanding beneath the bedrock of physics, by all means, wave the checkered flag. If you are going to present an argument from authority, you should at least get your authority correct. Second and more broadly, Katz’s blunder—and that’s what it is, a blunder—detracts from his point by calling into question his general commitment to facts and evidence. It was not a “short-cut,” as he asserted in a tweet. David Katz dismisses his error as a “short-cut” (link). It was and, since he hasn’t corrected his post, remains a mistake that suggests a casual disregard for facts. Or maybe he doesn’t think all facts are the same. Maybe some facts count more than others. Scientific facts—a calorie, for example—are a high-quality facts while historical facts are junk facts. Maybe this is some form of pop culture, New-Age history that questions the basic merit of “the fact.” Unfortunately, there is something of a cottage industry in this particular brand of history. Katz is not alone in his gratuitous and careless use of historical facts. 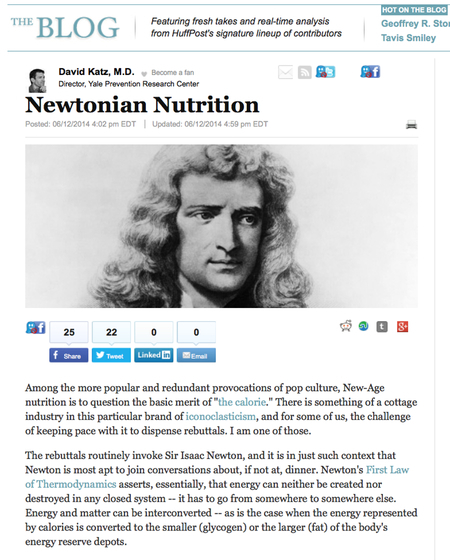 But just like his scientific colleagues, Katz didn’t need to invoke history, didn’t need to appeal to Newton in his criticism of “New-Age nutrition.” Once he did, however, he still has a scholarly and methodological (and an ethical and moral) obligation to get the scientific and historical facts correct. Katz should care about getting all the facts correct. Anything less subverts his argument and squanders an opportunity for real change.